Our team assessed the Champion Power Equipment 75537i portable generator. 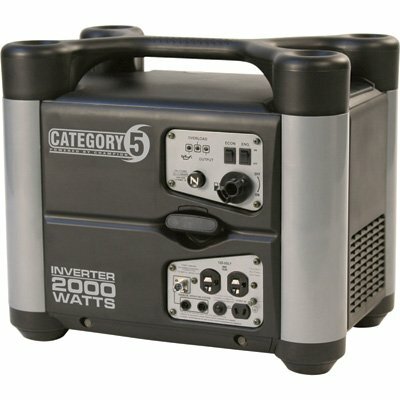 If you’re in the market for a high-quality portable generator, for use in the great outdoors, or as a back-up plan for the home, read our quick review below for all the details on this highly recommended product. This small, and user-friendly unit is capable of producing 3,100W of power at peak capacity, running at 2,800W. At 1/4 load, this generator will last approximately 8hrs. With a noise level of 58 dBA, this model is actually quieter than your average human conversation, which usually would measure about 60dB. Weighing 96.6lbs, this unit is heavier than it looks, yet it remains extremely portable. Enjoy clean power while this unit runs on a 1.6 gallon 171cc Champion 4-stroke engine, started either electrically, by a manual recoil, or by wireless remote. This unit has a built-in Low Oil Shut-Off, a useful feature that protects your generator from irreparable damage that happens when it runs out of fuel. Instead, with this feature, your generator will detect when fuel is running low, and automatically shut off. This unit does not however, avail of Automatic Voltage Regulation (AVR) which would ensure consistency in power output in order to preserve damage to your devices. As an added bonus, the Champion Power Equipment 75537i portable generator comes CARB compliant, and EPA certified. This product is backed by a three-year limited warranty and free lifetime technical support, guaranteed by Champion Power Equipment. Contact Champion if you have any queries regarding warranty details. We love the design of this generator. Weighing a hefty 96.6lbs, Champion Power Equipment have shown that they care about customer convenience, adding built-in wheels to the back of the unit, and two handles on top. Encased in hard plastic paneling, this model is robustly designed to be resistant to everyday wear and tear. From an aesthetics standpoint, Champion have carried out fantastic work in making their product look distinctive when compared to many others on the market. The bright yellow and black contrast makes the unit stand out in any setting. However, the best feature of the 75537i is undeniably the remote key fob. With this wireless remote system, you can start up your generator from up to 80 feet away. Gone are the days of clumsily fiddling with a manual recoil system, now you can simply click, and go. In summary, we would highly recommend this unit. Champion Power Equipment have blown much of their competition out of the water with this portable generator. Small design touches that would, at first, seem insignificant, are indicative of a company that cares about their customers. Features such as the built-in wheels, and wireless remote key fob are not essential, but highly appreciated. It is added features such as this, that separates the good from the great, and in our opinion, The Champion Power Equipment 75537i Generator, is a fantastic addition to the Champion roster of generator devices.